Great card Sylvie - I really need to make a start as no doubt I shall be panicking again come December! This is gorgeous Sylvie, such a cute image and I love your layout. This is gorgeous Sylvie. I love the cute reindeer and colour scheme. I must make some Christmas cards as I promised I would for my New Years resolution. I have not made one yet!!! I can then join you on your challenge. 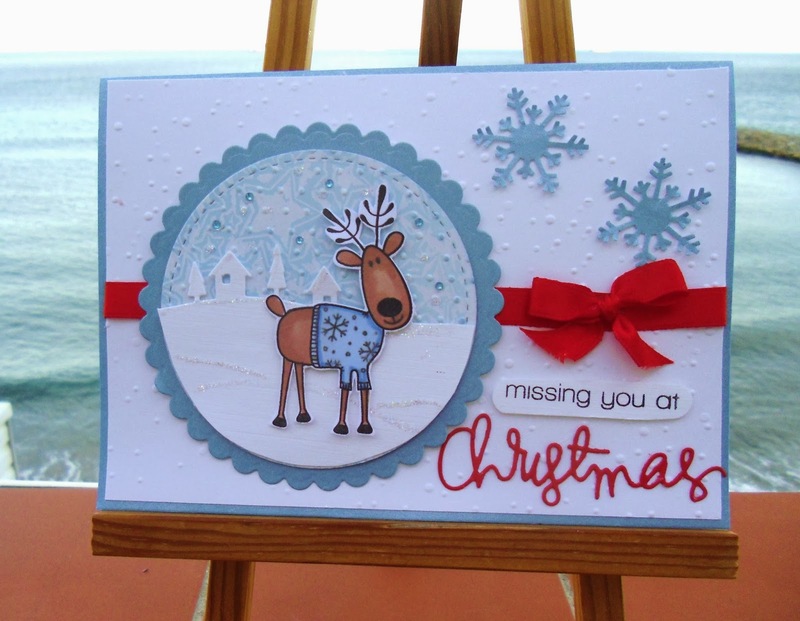 Hi Sylvie, awww that is one adorable reindeer and a lovely card. You are very good making your Christmas cards this early - I panic in December!!! You'd asked about the card blanks I ordered. They arrived today and, to me, they are slightly flimsy as I make my own from 300gsm and these are 260. However I'm just spoilt from making my own and picking my own card weight! They fit the envelopes and I'll be making some cards from them soon. No problems at all with the order and delivery (tho to the UK) was quick. Oh and they are listed as landscape cards - I've just turned them on their side so the fold is at the top. Fab card, your Rudolph character is gorgeous and the sentiment is lovely. I love that reindeer in his jumper and your card is wonderful. Aaaaaw! He looks like he could do with a cuddle. Cute card, Sylvie. Oh this is so adorable and gorgeous. A great Christmas card! Love the image. I am finally getting chance to catch up with the world after a very busy few weeks. We are having some lovely sushine at the moment!!! Woo hoo!! !